With first publications on the subject having been printed, the authors can mutually quote themselves, which creates a semblance of trustworthiness. Elevated to the “scientific level” in this way, and with references to environment and climate change, this new “field of research” is suitable for the submission of project proposals. This incites others to join without critical reflection. Since the insiders are shielded against the public by their specialist knowledge, they can feel unobserved and thus develop their research virtually without restriction. They shun critical inspection and questions, and they respond to them with joint defense and with the pretended conviction that the allotted research funding serves as evidence of the meaningfulness of their work. Nowadays, with the praised ability of science to correct itself being weakened, one cannot expect that within the mutually supportive group of research fund recipients someone is courageous enough to mistrust the idea that feeds him. Therefore, structures of that kind appear stable but as soon as the base is taken away, the allegedly clever idea at the beginning, the concoction of alleged results breaks down utterly. The sequence of things described here may seem unbelievable but can be substantiated with facts. Suitable for this purpose is a case from palaeobotany, the worldwide research on “oribatid mite coprolites” in petrified wood. The phenomenon of the alleged fossil mite droppings is simple, instructive, and can be explained such that it is easily understood also by non-professionals . Despite of plain contrary evidence the involved scientists promote their cherished subject with latest publications [2,3]. In order to cleanse science from aberrations of that kind, doubts must be raised outside the group of insiders, and an erroneous idea must be refuted despite of the resistance of its often influential proponents. This is no easy task because the involved scientists prefer to retreat behind publications and quotations instead of confronting reasonable arguments, or they resort to haughtiness, or pretend to be offended in order to avoid discussions. How will the curious aberrations be judged in the future ? All those who contributed will be named: those who carelessly initiated such development, those who accelerated and spread it, and those who helped with “discussions and advices” or favourable reviews instead of warnings to be careful and to critically think the matter over. Also it will be reported that some perseverance was required to expose consecutive publications on a subject as ill-conceived, and to finally irritate the authors such that they think it over and leave the happily trodden erroneous path. There will be warnings against the errors which have been accumulated in the scientific literature without ever having been corrected, since virtually none of the authors who drew conclusions from false assumptions has later retracted them. When students come across an error in the scientific literature unawares, it may merely give rise to transient frustration but all carelessly committed follies taken together are like morass on the road of scientific progress. An example of unsubstantiated conclusions is found in connection with oribatid mites and their “prominent role … in Permian terrestrial ecosystems” [2,3]. The alleged coprolites of the elusive oribatid mites may serve as a warning against a kind of feedback which can elevate an initial folly to a subject of worldwide vain research. In 2015 this essay has been distributed among professionals and people who simply might be interested in the ways of science and its tendency to go astray occasionally. "Be careful! Ventarura is watching you. This may serve as an encouragement to palaeobotanists to work carefully as if they were watched." 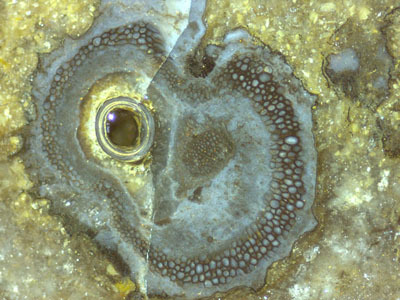 This has also been distributed among those to whom it concerns, as one of the repeated attempts since 2007 to refute the hypothesis of oribatid mite coprolites in petrified wood, which is a favourite idea among palaeobotanists worldwide even without any mites seen, by means of ridicule where serious argumentation is ignored. Apparently this effort has not been in vain, at least with the Naturkunde-Museum Chemnitz: A comprehensive publication in 2016  on the Early Permian of Chemnitz lists quite a number of invertebrates and their traces but does not mention the elusive oribatid mites although they had been the subject of several recent and previous publications since 2000 or earlier. Judging from experience one can guess what comes next: The erroneous publications on petrified wood with oribatid mites will not be retracted or declared false but they will simply not be mentioned any more, thus remaining a source of confusion to the readers. This applies also to tree trunks offered in Chemnitz as petrified charcoal. Palaeogeography, Palaeoclimatology, Palaeoecology 441(2016), 627-652.